Please find some general info about the AFR+ listed below. Be sure to also navigate to the tech note section for each specific vehicle in the PRODUCTS section. If you require additional assistance then please CONTACT US by phone or send us an email so we can help. Please make check sure you understand the AFR gauge's LED functionality before advancing through technical support. Please go through the AFR+ Unit Funcationality page and view some of the sample videos. The AFR+ system is an AFR gauge first and can be used to diagnose problems with your vehicle. At times you will need to enter the diagnostic mode to understand how your vehicle is operating. Watch the video and learn the steps here. The AFR+ system is made up of 3 core pieces: AFR Gauge, Wideband Controller and Bosch O2 Sensor. The AFR gauge is the brain of the whole AFR+ system. The wideband controller is the slave device to actually fire the injectors and take readings from the O2 sensor to send the information to the gauge. The Bosch wideband O2 sensor is a 3rd party product provided to actually read the air/fuel mixture in the exhaust. Double check your mode settings. Improper fueling can make your vehicle run worse. Enter into the Red/Blue mode and swing the needle all the way both ways before resetting back to the correct setting. This will make sure the stepper motor which operates the needle is functioning ok. Disconnect the AFR gauge from one of the 8 pin sub-connections in the gray cable. Check if your vehicle will run correctly at idle. This test will determine if the wideband controller is firing the injectors correctly. 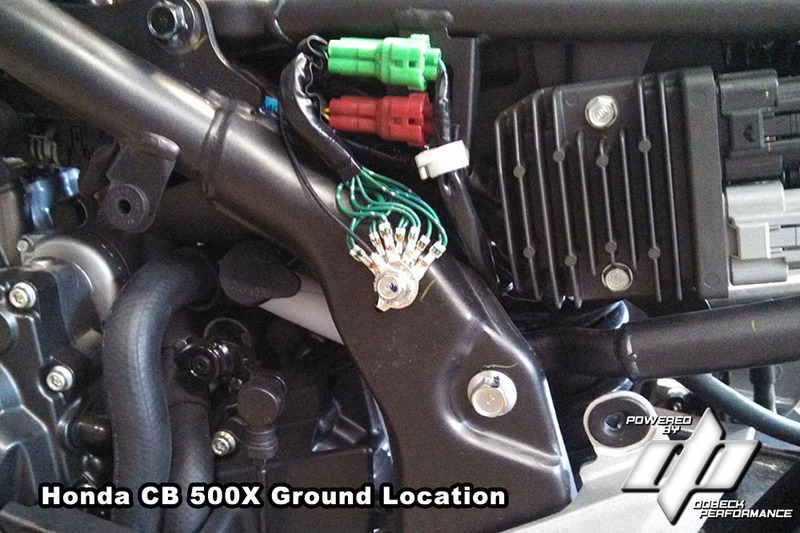 The system will run off the stock ECU map and not make any fuel adjustments. Change to a different Bosch O2 sensor. We HIGHLY suggest carrying an extra O2 sensor at all times. May 1st, 2016 - AFR+ Version 3.1 Release Date - DP released a new compiler to develop code within the AFR Gauge for all applications. Update suggested for all BIKE units. NOT necessary for off-road applications. March 1st, 2016 - AFR+ Snowmobile / Snowbike Update - All Pro RMK and Snowbike units are now being sold with two different power-ups. Suggested to use harness to run system off the battery if your vehicle is equipped with a battery. Other supplied harness allows system to operate based on gaining power from the injector connection. July 1st, 2015 - AFR+ Version 3.0 Release Date - DP released a firmware update for their wideband controller for all applications. March 1st, 2015 - AFR+ Version 2.1 Release Date - DP released a firmware update for the wideband controller for all applications. October 20th, 2014 - AFR+ Version 2.0 - Clean Power Update - DP has upgraded the wideband controller to now include a relay harness which will connect directly to the battery. The upgrade is being made to ensure the DP system is receiving "Clean Power" through their electronics. August 1st, 2012 - AFR+ Version 1.0 Released - Official release date of the AFR+ after completing beta-testing. Do you have any questions related to installing the AFR+ unit? Look here to find out the basic installation procedures and also view some short informative video clips. This section goes over connecting into the injectors, hooking up the ground, and mounting the AFR gauge. Are you having a problem with your AFR+ controller? Your vehicle is running poorly or erratically? Read through these frequently asked questions to see if you are having a common problem. If you find nothing applying to your situation then you will need to contact us for further assistance. Everyone has the capability to tune their vehicle with the AFR+. We are not going to make you a pro, but we can show you what to look for to improve your vehicle's drivability. We will also list our recommended settings and explain each adjustment mode.